Gary Johnson, a Montgomery County farmer, walks through his field of soybeans to view the benefits of his cover crop. Every Iowa farmer has a different approach or philosophy when it comes to his or her operation. Gary Johnson of Red Oak, IA, began his own operation in 1973 and had plenty to share. “I picked my land up piece-by-piece over the years,” said Johnson. He now farms 500 acres of corn and soybeans in rural Montgomery County. Johnson was ecstatic to tell his story as he drove his Jeep down a minimum maintenance dirt road and he seemed unaware of the 90+ degree heat of the July afternoon. After arriving at the field, Johnson motioned to his soybeans where the remnants of his fall-seeded cereal rye were still visible and said, “From my perspective, I’m not a big farmer, so why not go after the biggest possible yield with what you have?” He is no stranger to cover crops; in fact, Johnson plants cereal rye and, occasionally, radishes and rapeseed on all 500 acres of his operation. “It’s working well,” Johnson said, “I’m not going to tell farmers how to plant, but try some!” I asked Gary what his motivation for planting cover crops was and his response was very indicative of the kind of man he is. “I kept receiving phone calls to fly the stuff on,” said Johnson, the owner of a local helicopter service. “I thought if I’m in the business to put this on, then I need to be doing it myself." Pictured above is one of four helicopters owned by Johnson Helicopter Services. Cover crops have been rapidly gaining popularity in Iowa over the last decade. According to Practical Farmers of Iowa, cover crops usage has grown from fewer than 10,000 acres in 2009 to about 600,000 acres in 2016(1). However, in order to meet the goals of the Iowa Nutrient Reduction Strategy, the amount of acres that grow cover crops must increase tremendously. Gary shared why he thought other farmers are reluctant to adopt the practice, “You know, it’s natural for people to not want to change; this is the way it’s always been done.” He went on to say, “If we do this year after year after year, we’re really going to see big benefits.” His words were reflective of the passion he had displayed for the land he owns. In his field, we looked at the “mat” as he called it, that the terminated cereal rye had left. Gary was gleaming as he spoke of the superb weed control the remaining cover had provided him and how his soil looked better than ever. “God put earthworms here for a reason, they’re beneficial,” he said as he dug beneath the soil surface with his hand. Photo shows the “mat” of residue left in Johnson’s field after he terminated his cover crop of cereal rye. After looking at his soybean fields, the tour continued a few miles down the gravel road to one of his cornfields. On our way there, Gary spoke of his family. “My son went to Iowa State, you know. Well, for almost four years and then he said, ‘Dad, I’m going to take a detour’ and he joined the Navy to work on nuclear reactors.” Johnson’s son is aboard the USS Theodore Roosevelt currently stationed in San Diego, California but will soon be deployed to the Persian Gulf. In the absence of his son, Gary's wife helps him out around the farm. It is often hard to get to know a person after spending only a couple of hours with them, but Gary showed who he was by sharing his vision for the land he owns. He clearly viewed his land as an investment and it was as if planting cover crops meant that he was planting for the future generations to come. As we left the last field, Gary looked over, chuckled and said, “So that’s part of my story. I just wish I was 20 years younger so I could stick around and enjoy all this stuff." Gary Johnson speaks about the root penetration of his cereal rye cover crop. Johnson speaks about his hydrostatic aerial sprayer. 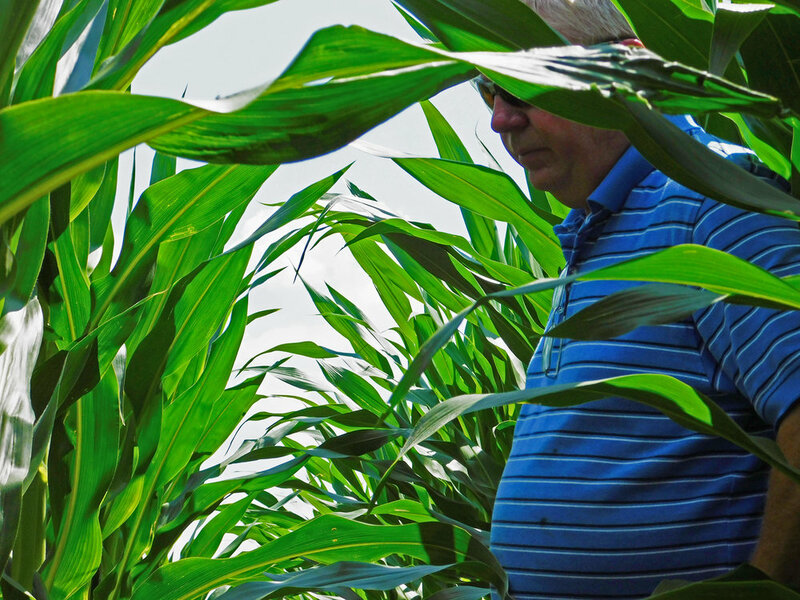 Montgomery County farmer, Gary Johnson, gazes over his soybean field with terminated cereal rye. Johnson's farm is located near Red Oak, IA in rural Montgomery County. Johnson farms 500 acres of corn and soybeans in southwest Iowa and has cover crops on all 500. A native of the area and a descendant of a family of farmers, Johnson looks out over his land in Montgomery County, IA. 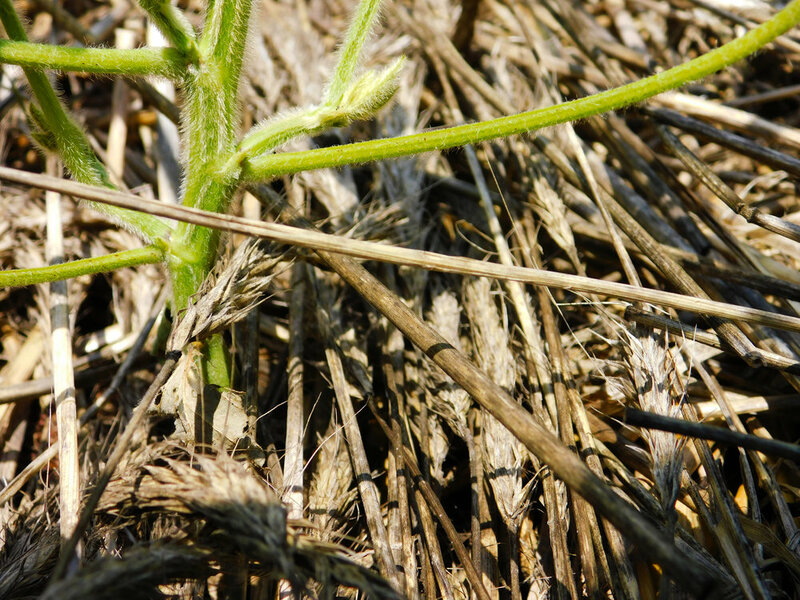 Johnson terminated his cereal rye cover crop in early April when it was nearly 3 feet tall. This is the remaining cover. Johnson discusses his farming philosophy in his field near Red Oak, IA. Johnson examines his corn crop on a hot July afternoon. 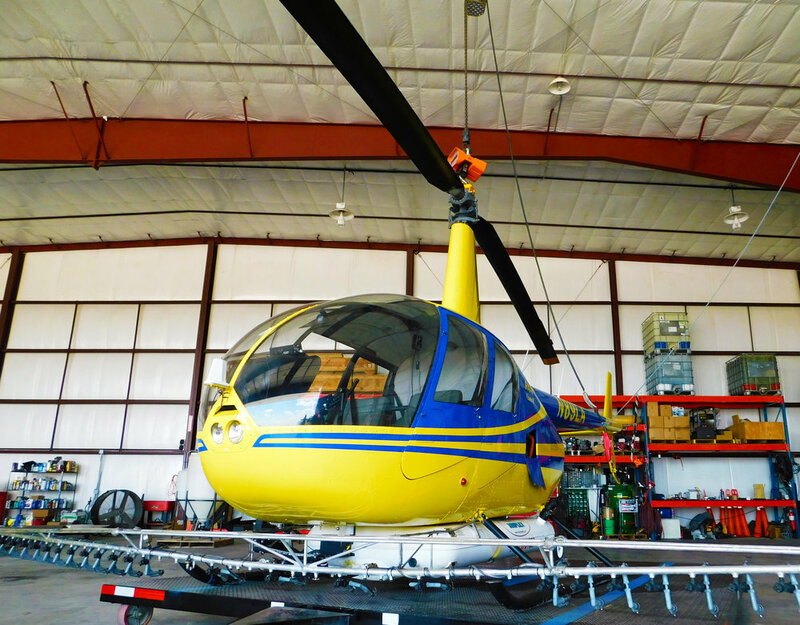 Johnson owns a local helicopter service where he flies on cover crops and pesticides. Johnson explain the value of his aerial seeder when it comes to cover crop application.